Rainsong: It’s another seminar in psionics here at the social club. Rainsong: Any questions arising from Part 1? Scelana: Hello Kate, how are you doing? Rainsong: Or we could go for the more nasty and dangerous stuff. Rainsong: Might as well handle Whisp’s question first, unless anyone has objections? Rainsong: Espionage is basically the task of acquiring information about somebody’s activities/plans/equipment/stuff that the somebody doesn’t want you (or anyone) to know about. Rainsong: Let’s say for example, that country A is developing a new kind of canoe for their darkwater navy. Rainsong: And country B wants to be sure their anti-canoe methods remain state-of-the-art. Rainsong: Because we’re doing an in-depth series on RV, I’m not planning on going into how the RV approach to this is done, right now. Rainsong: Prepare yourself however you normally do for a receptive psychic thing. Rainsong: For many people, this involves some kind of quieting and calming the mind. Rainsong: If you prefer jamming to goth metal, you do you. Rainsong: Decide whom you wish to eavesdrop on. Do you know anything about the individual, or just their job description? Rainsong: The more you can focus and home in on the person, the better. Rainsong: You know the magic users’ obsession with blood spots and clips of hair for their spellcasting? They aren’t wrong. (It’s disgusting, but not wrong.) There probably isn’t a better way to target than using a bloodspot, shy of actual physical contact with the person you’re targeting. Rainsong: And because I am not going to go into how to conduct a forced interrogation via telepathy, other than to observe that it can in fact be done and can cause a huge amount of damage to the person being interrogated, physical contact isn’t useful for our current discussion. Rainsong: Your chances of having a handy file of bloodspots on hand to target canoe technicians of hostile countries are probably pretty low. Rainsong: Can you get a picture and name from their organization’s website? This is surprisingly common, these days. Rainsong: Professional spooks are often clever enough not to put their pictures and names on “Spooks R Us (dot) org” but it’s possible that the folks in the practical parts (rather than intel) parts of the program might have breached security protocols. Google-sensei is your friend here. Kate Embers: Makes sense so far. What would you do if you can’t get some of their tasty blood, their name, an image, etc? Rainsong: Or, use several, even. Rainsong: Questions and / or commentary at this point? Rainsong: Now, as you know, telepathy is not only receptive. Wayfarer: I know you mentioned that you don’t particularly mean to go into the remote viewing thing, but just for the sake of completeness it’s worth mentioning targeting can be done in a very similar way with the viewer blind to the target entirely. Rainsong: I think there’d be very few things you can self-target in “garden variety psychic stuff” that you couldn’t target in RV, actually. Putting aside whether it’s a good RV target. Can you think of any, Wayfarer? Wayfarer: You can basically assign a coordinate arbitrarily to anything, one of the strengths of the system. Clovers: Do you believe it is appropriate to stick with a coordinate system in the long run? Rainsong: chuckles And often those four or five different people are pointed at different aspects of the target, instead of using entirely the same target prompt. But both ways are done. Rainsong: Clovers: “appropriate”? In what way? Wayfarer: It’s a very convenient way to maintain a blind on the target. If that’s not a concern (for any number of reasons) then I wouldn’t use one, no. If I want to get at a target for my own purposes then I’m just going to go after the target, I’m not going to bother sanitizing it with coordinates and random card draws and such. It’s only really strictly necessary if you’re trying to hit targets without any frontloading. Usually that’s more a concern of the tasker than the telepath. Clovers: I don’t know what the popular opinion is around here, but I always thought rv was good for training a person to clear their mind and open up to receiving input. I consider it as more of a beginners thing to learn from and move on. Wayfarer: It can certainly help if you’re going after something somewhat specific where you could easily substitute “guessing” or “figuring out” vs. actual telepathic sensing. Even very sensitive psychics can struggle with signal vs. noise when there’s conscious data available, barring something like employing trance states or somesuch. Rainsong: There’s a variety of opinions on the matter, here, of course. Clovers: Sorry, I don’t mean to derail anything. Just peeked in while on break. Rainsong: No, no. That’s fine, Clovers. Wayfarer: I’d almost take the opposite position – you have to be able to clear your mind and open it up to recognize input and be successful in RV, as a training tool for that purpose it’s about as good as any other method. Its strength is in its ability to demonstrate its validity and to isolate out frontloading and guesswork and so on. If you’re not terribly concerned with that, RV’s not really great and can in fact be markedly less useful. Clovers: I just see rv practice to be a different kind of trance state with a goal. Like an alternative to recommending meditation. Wayfarer: The whole point of the RV protocol as we use it today is to be something you can show to Important People In Suits and go “yeah no this definitely works, here are a Lot Of Numbers that show it, please give us money.” It’s pretty good for that. 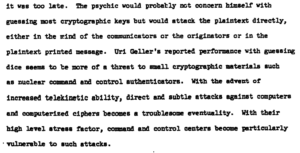 It has some other advantages when you’re trying to get information about something and for whatever reason “that it’s psychic in origin” is important to you. It’s not always and I think in a lot of cases people do fixate on it. Wayfarer: Why I mentioned the use of coordinates in this case is that tasking is often done in a way where you want to remove the guesswork. It’s not particularly useful information if I ask someone to get me information about a person and they essentially cold read. When we’re targeting things for ourselves (like if I want to know something about, say, an interviewer prior to a job interview), we’re already on guard against and trying to avoid guessing, because, well, guessing doesn’t give us any new information. But if someone else wants me to get in someone’s head, them keeping me blind to the target is not a bad idea – if nothing else, if I whiff entirely, they’ll know quick-like. Wayfarer: Nah, back to the projective bits. Rainsong: Targeting of projective bits can be done the same way as for perceptive bits. Rainsong: What would projective telepathy be used for in espionage, military intelligence, and so on? Rainsong: projective is mostly useful for interference than intel gathering as such. Rainsong: Distractions while doing things where distraction is bad or falling asleep suddenly in inconvenient circumstances… I’m sure you get the idea…. Scelana: Is it also possible to go and try to wake them up from their sleep somehow and if so how useful would that be? I’ve also heard of telepathic suggestion aka tps on sites, how viable/useful is that? Rainsong: Sure, you can wake them up. Sleep deprivation can really muck with a person, so waking them up several times a night for several nights running can be useful operationally. Rainsong: Parents sometimes use it to wake up their teenagers in time for school, and to get infants and toddlers to sleep at reasonable hours. Rainsong: It’s not that different from “fatigue-banishing” except you’re affecting another person, and not just yourself. Rainsong: Questions? Commentary? Or shall we call it a night? Azarea: @Rainsong has there been any recorded protocol of successfully extracting highly precise data with low error tolerance, like technical information, passwords, blueprints, or similar where metaphors just don’t cut it? If yes, is there any method to this? The envelope predict-what-image-you’ll-see trick is great but doesn’t generalize well, is there better? Wayfarer: Let me see if there’s anything in the big ol’ NSA paper about it. 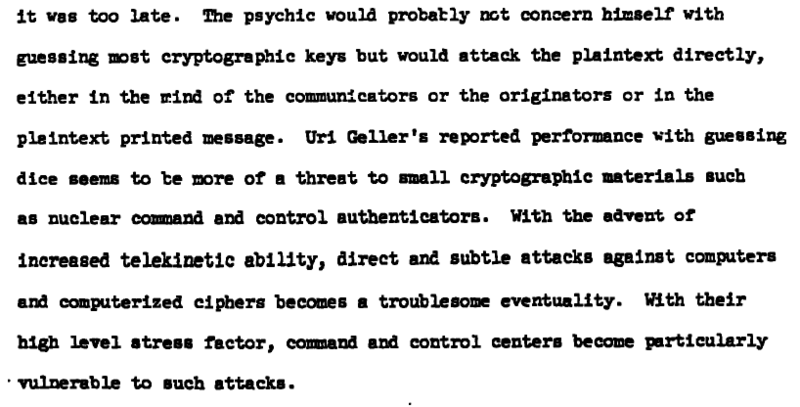 Rainsong: Associative Remote Viewing and/or Dowsing can be used to get passwords, given enough time. Rainsong: Blueprints and the like are typically assumed to be “imprecisely copied” when they are accessed at all, but some kinds of technical information has been acquired via psychic means. Military use would normally involve some kind of RV or dowsing. Wayfarer: I’ll keep skimming but if I recall correctly the concern was mainly that “highly precise data” might be bypassed rather than accessed. Wayfarer: https://www.cia.gov/library/readingroom/document/nsa-rdp96x00790r000100030008-7 Report in question, by the way. Rainsong: I’m more familiar with the “bypassing”, personally.